Well, here is my design, all in strips on my little portable design wall. Ok, you might be wondering what you are seeing? Well... its kinda hard to explain... but sometimes I really don't sew all those angles from my strip segments together, I use glue. I'll admit it - I really don't like piecing all that much. 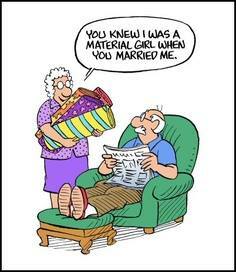 (True confessions - from a quilter - can you believe it!?) I. Really. Don't. Like. Piecing.It takes too much time. I just glue down the background strip, glue the angle from the top strip closed and then glue the top strip on top of the bottom strip. Once all the strips are in place on the foundation, I just use monofilament thread and stitch them down. Because I use a tear-away foundation, all I have to do is fold and sew along grid lines that I drew on the foundation earlier. (Hmmm. I'll have to explain that in another post. Actually, I have a patent on this type of quilt top construction. I use it to make all my watercolor quilts too!) Anyway, here is the quilt top, now all I have to do is add the flowers and quilt it. And here is the finished quilt - Ta Da! This is stunning, beautiful colours and it makes me want to go there for a visit. I'm the opposite to you, I like piecing but I'm not that keen on the quilting part. Thank you. I'll tell you a secret.... the inspiration for the quilt came from a photo of Montenegro, lol. We have a mountain range here in the east called the Blue Ridge Mtns and since I was working with so many blues, that name fit. I have a way to go before I'm totally comfortable with quilting too. 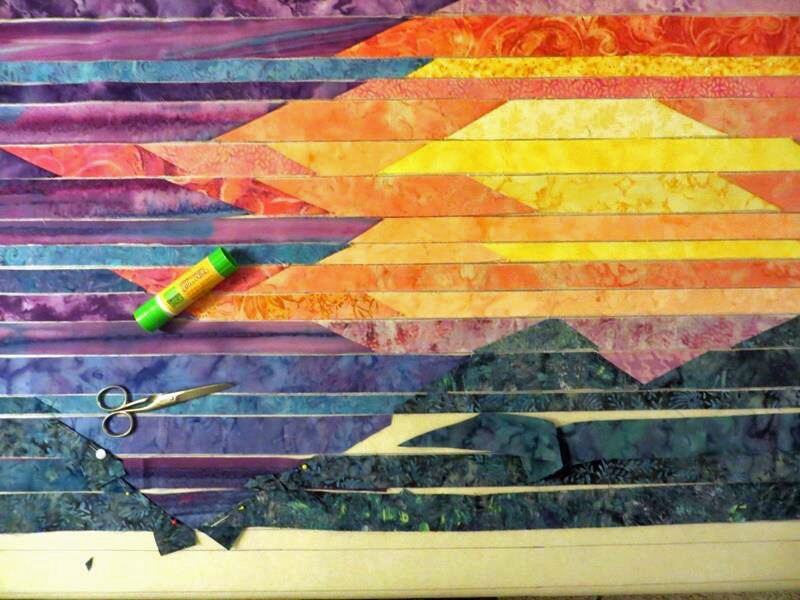 These strip pieced landscapes are pretty easy to quilt with long wavy back and forth horizontals. Thanks for writing! What technique did you use for the flowers? Hi Karen, they are just fusible applique. I found the perfect flowers and leaves from 2 different prints and put them together to make the azaleas. Or rhododendrons. Thanks. Your quilt is beautiful. 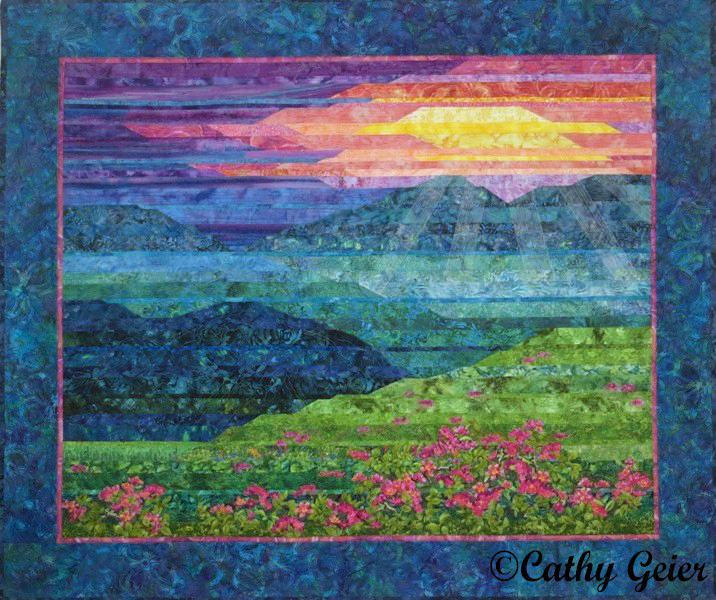 I'm new to your blog and your art quilts. 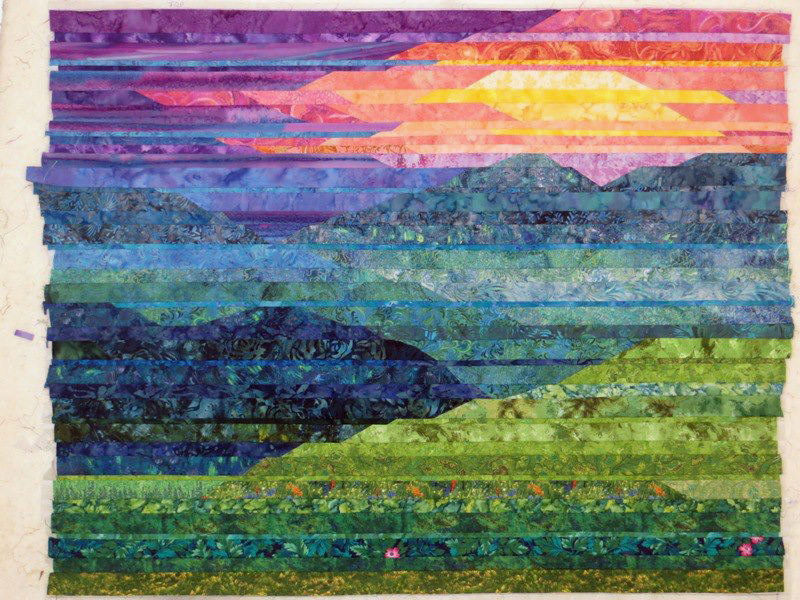 Your style of landscape art quilt is my dream project. I say "dream " because I'm still dreaming about how to get started. LOL! (Love the gluing tip by the way) Thank you for showing your process. It really helps me to understand the steps more. I suppose I could look for a book or take a class, but that's not me. I want my "vision" to guide my process - not the other way around. So, thank you! Oh! And I actually live in the Smokies (technically The Blue Ridge Mountains) in North Carolina! 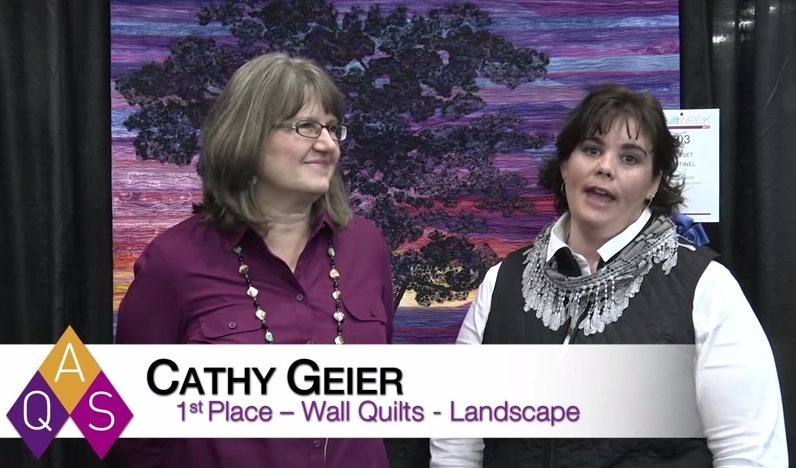 I've also made landscapes using a fusible tricot knit that you'd get at a Joanne's. (Not the kind with dots of glue!) I've laid out and arranged strips on the rough side and then pressed them with steam to fuse them down. 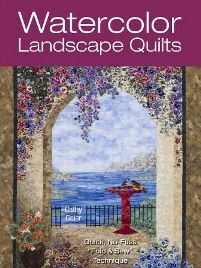 Anyway, I hope you fall in love with landscape quilting as much I have! Thanks for writing to me. Since your beautiful quilts start with a photo inspiration, how do you handle the "Copyright " issues? Do you stick with only your own photos? Or do you contact and request permission? I worry about it, but I can't take all the photos for my inspirations. I wish our copyright laws were current to this day and age on the internet and I recommend to anyone listening that they try to put their name on all the photos they upload of their art. There is no problem for personal use of any photo in the world. The problem comes if you get money as a result. No matter what photo you start with, if you become a famous quilter because of it, it's still your WORK that you're being celebrated for, not the image. Anyway, that's my guess, I'm not a lawyer. But since most of us will not become rich and famous, I'd say use any picture you want for your quilts and put the photog's name somewhere. In web publishing this means a credit line. Since we're talking about creative quilting, why not put the photog's name in the quilt? You can quilt his/her name in the stitching, or stick a label on the back... Being creative is always a good thing! The law will never catch up to human creativity. Basically anyone wishing to use another's work must get their permission first. I don't think this is always possible though, not at all now that photos are all over the place and rarely linked back to the original photographer. I like your idea of quilting in the name of the photographer. I remember a waterfall quilt I made a long time ago based off a photograph and I photo transferred the image onto the quilt label on the back of the quilt. Thanks for the idea! Felicitaciones tiene usted un canal en youtube ? You have inspired me to make a sun with the rays. I am going to use tulle for the rays. I couldn't figure how to make the mountains or background until I read your instructions. Thank so much. Mine is going to be much simpler, but I want to try it. Thank you. Awesome work. I consider this a fortuitous find today.....your site is so inspiring. I am from the Blue Ridge and Shenandoah Valley area of Virginia.....so many beautiful sites to inspire one. I am curious about the tear away foundation. I've never heard of it...can you tell me more about it? Love the idea of a forthcoming book.....get it started lady. Hi Mickie, this is an older post - my book has been out for a couple of years now, lol. 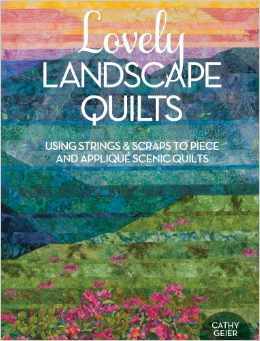 It is called Lovely Landscape Quilts and I go into detail about the tear- away foundation and how I use it to piece. I sell the stuff on my website and I sell my book there, too. I'm beating amazon's prices by over 3$ now. *End Shameless Plug*. If you click on the label 'strip pieced' you'll see even more about how I use the foundation. Thanks for the compliments - I'm glad you were inspired! So happy that I "happened" on this post. 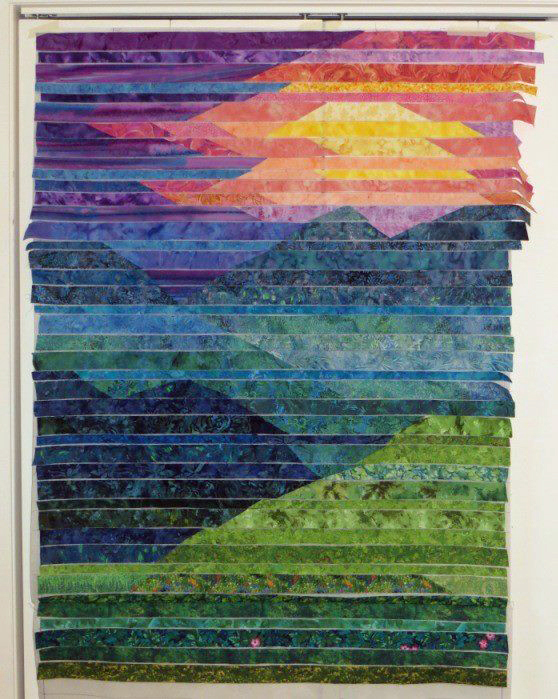 As some others have commented, I have been wanting to try this type of quilting, but have had difficulty in trying to figure out how to start. Since I am not gifted with any drawing ability, this type of quilt may be way beyond my capabilities. However, lack of talent doesn't keep me from appreciating your beautiful work! Thanks for sharing it with us. This information may be mentioned elsewhere on your site, but how did you get started? God bless. Hi and I'm so glad you liked watching me put this together. 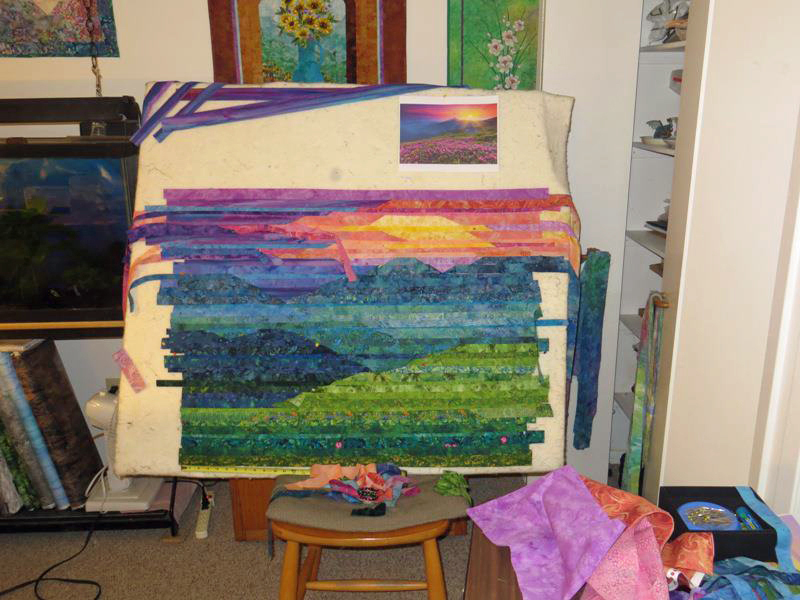 My start in quilting was in hand piecing/quilting traditional blocks. Then I got hooked on landscapes!